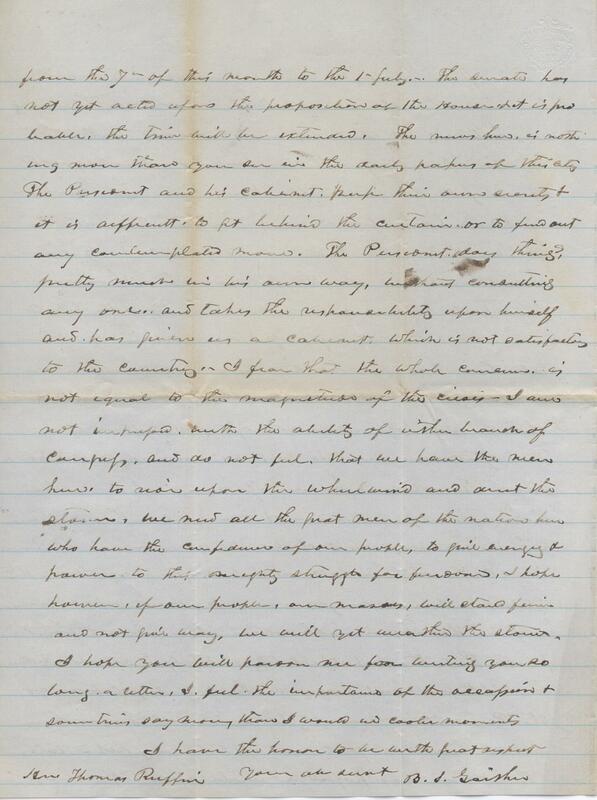 Item description: Letter, Burgess S. Gaither to Thomas Ruffin, 1 April 1862. Gaither, a Burke County, N.C., politician and member of the Confederate Congress wrote of the military disaster in which Roanoke Island was lost and the resulting investigation. He also criticized the governing style of President Jefferson Davis in light of the magnitude of the crisis. Item citation: in folder 450 in the Thomas Ruffin Papers #641 in the Southern Historical Collection, Wilson Library, University of North Carolina at Chapel Hill. 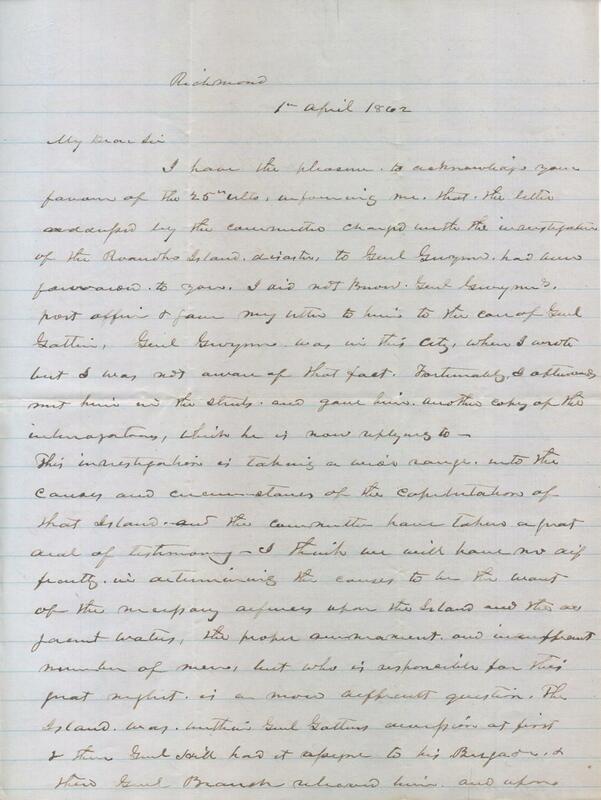 This investigation is taking a wide range into the causes and circumstances of the capitulation of that Island and the committee have taken a great deal of testimony_ I think we will have no difficulty in determining the causes to be the want of the necessary defenses upon the Island and the adjacent waters, the proper armament and the insufficient number of men, but who is responsible for this great neglect is a more difficult question. The Island was within Genl. Gatlin’s accession at first & then Genl Hill had it assigned to his Brigade & then Genl Branch relieved him and upon the 21 December a distinct Brigade was made including that Island & all the territory embracing the Albermarle Sound & its waters, and Genl Wise assigned to it with instructions to report to Genl Huger at Norfolk. So you will observe, that no one of the respective officers are responsible, but for a short time, and in fact, not of them but Genl Hill & Genl Wise have ever taken much interest in the post. Neither Gatlin Branch or Hughes has ever been there. Genl Hill would have put the Island in a state of defense, if he had have been let alone, and I have no doubt Genl Wise would have done the same thing, if he had have had time to have done so before the attack. 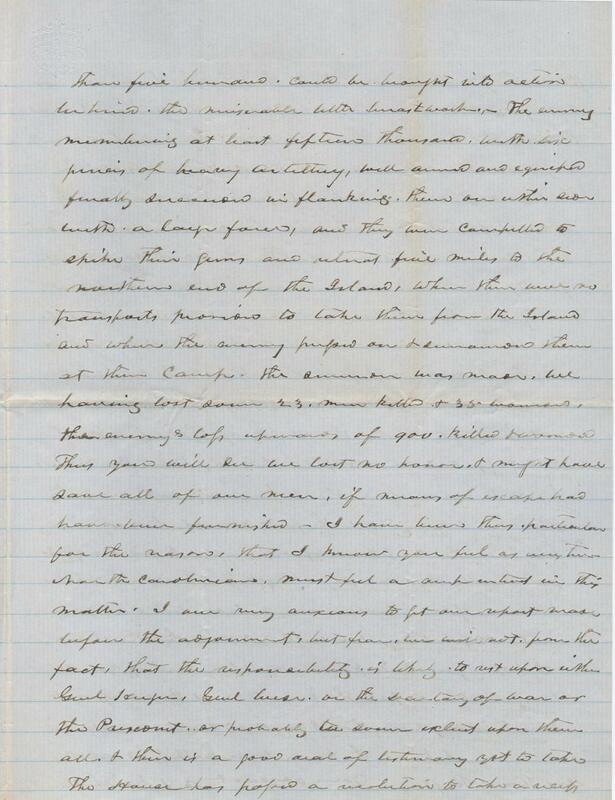 The committee have made a full investigation of all the circumstances attending the capitulation and I am very happy to say to you that our troops have been most shamefully slandered._ Col. Shaw and his whole command acted in a manner entirely creditable to themselves and the state, and was compelled to surrender when overwhelmed by numbers. They fought the enemy on the 8th of February at the only breastworks or redoubt, upon the Island for five hours, with only their small pieces of artillery, and numbering less than one thousand men in fact not more than five hundred could be brought into action behind the miserable little breastworks. The enemy numbering at least fifteen thousand with six pieces of heavy artillery, well armed and equipped finally succeeded in flanking them on either side with a large force, and they were compelled to spike their guns and retreat five miles to the northern end of the Island, where there were no transports provided to take them from the Island, and when the enemy pressed on & surrounded them at their camp. The surrender was made. We having lost some 23 men killed & 35 wounded, the enemy’s loss upwards of 900 killed & wounded. Thus you will see we lost no honor & might have save all of our men, if means of escape had have been furnished_ I have been thus particular for the reason that I know you feel as every true North Carolinian must feel a deep interest in this matter. 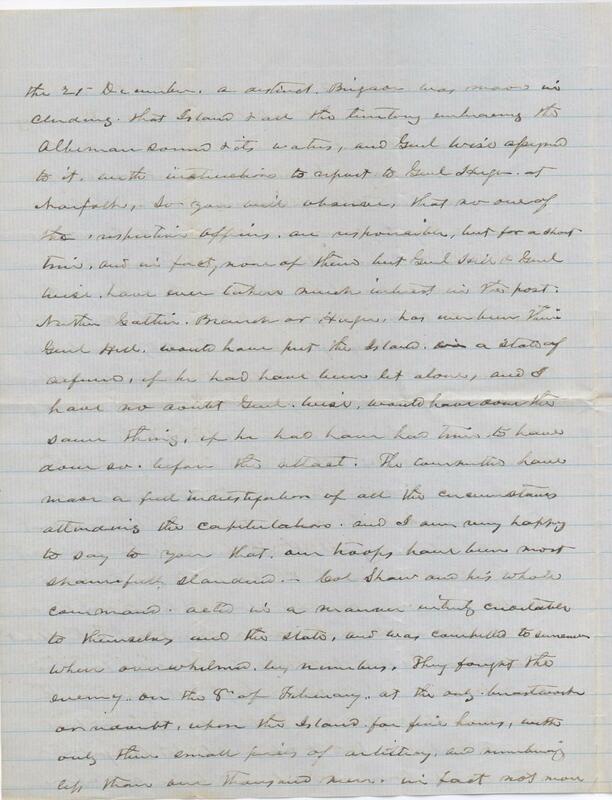 I am very anxious to get our report made before the adjournment, but fear we will not from the fact, that the responsibility is likely to rest upon either Genl Huger, Genl Wise or the Secretary of War or the President or probably the same [?] upon them all & their is a good deal of testimony yet to take The House has passed a resolution to take a break from the 7th of this month to the 1st of July. The Senate has not yet acted upon the proposition of the House & it is probable the time will be extended.The news here is nothing more than you see in the daily papers of this city. The President and his cabinet keep their own scouts & it is difficult to get behind the curtain or to find out any contemplated move. The President does things pretty much in his own way, without consulting anyone and takes the responsibility upon himself and has give us a cabinet which is not satisfactory to the country. I fear that the whole concern is not equal to the magnitude of this crisis_ I am not impressed with the ability of either branch of Congress and do not feel that we have the men here to rise upon the whirlwind and [?] the storm. We need all the great men of the nation here who have the confidence of our people, to give energy & power to this mighty struggle for freedom. I hope however, if our people, our masses, will stand firm and not give way, we will yet weather the storm. I hope you will pardon me for writing you so long a letter. I feel the importance of the occasion & sometimes say more than I would in cooler moments. This entry was posted in Southern Historical Collection and tagged artillery, Burgess S. Gaither, casualties, Col. Henry M. Shaw, Gen. Benjamin Huger, Gen. D. H. Hill, Gen. Henry A. Wise, Gen. Lawrence O. Branch, Gen. Richard C. Gatlin, Gen. Walter Gwynn, Jefferson Davis, Roanoke Island, Thomas Ruffin. Bookmark the permalink.